When planning which old and new traditions to share with your family this year, be sure to include some your senior loved one can enjoy. 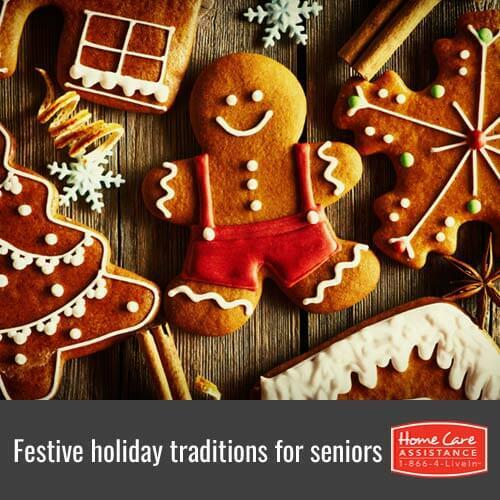 Traditions can help seniors feel connected with family and make the holiday season more fun and enjoyable for them. Rhode Island hourly care providers can suggest a few holiday traditions to cherish with your senior loved one for years to come. When you plan the menu this year for your family’s holiday dinner, sit down and ask your loved one about favorite foods that he or she used to prepare. If your loved one has special recipes for making these dishes, ask if your loved one minds sharing them with you. Include some of these preferences in your menu this year and for years to come. Preparing and eating a cherished recipe can be a wonderful way to blend an old and new tradition and is an excellent way to spark your loved one’s memory. One of the most exciting traditions for all ages is choosing and decorating a Christmas tree, whether you’re getting a live tree or using an artificial one. If your senior loved one is well enough to help you choose a tree, have him or her join you on a trip to the tree lot. If not, be sure to include your loved one in the festivities once you bring the tree home. Designate a task suitable for your loved one’s capabilities, whether it’s decorating the tree, putting hooks on ornaments, or simply making suggestions about where ornaments should be placed. A nice add-in might include taking your loved one with you to choose a new ornament or two each year to put on the tree. Even senior loved ones may be cheered by opening a present on Christmas Eve. Gather all of your family together and have each person choose a present they want to open, or choose for them if there is a particular gift you want them to open. After every person has a present, have each member of the family take turns opening the present and try to find out whom it is from. This can be a fun activity to help everyone feel loved and appreciated, especially your senior loved one. Likewise, seniors often enjoy seeing what the kids get to open and how excited they are to receive an early gift. Choose a day each holiday season or a time on Christmas Day to get together and look at old holiday photos of family and friends from past holidays. Remembering happy times from the holidays can make your senior loved one’s Christmas festive and bright by helping them connect with past memories. This can be especially therapeutic for senior loved ones with memory loss and who receive Rhode Island Alzheimer’s home care, but all seniors can benefit from getting in touch with beloved holiday memories. Holidays can be difficult for seniors without the right support and mental stimulation. Fortunately, you can help your senior loved one fully embrace the holiday spirit when you reach out to Home Care Assistance. We provide as-needed elderly home care Rhode Island families can trust, whether you need us to watch your loved one for a few hours a week while you prepare for the holidays or your loved one needs live-in safety monitoring and companionship this Christmas season. Call us today at (401) 284-0979 to give your senior loved one the gift of comfort and support this year.